Let's be real. Camping can get pretty dirty. After a day in the back country you start to stink and it only gets worse as time goes on. Thankfully there's a solution. Portable showers are meant for car camping but if you're crazy enough you could probably haul one out into the wilderness backpacking if you really wanted to. Let's take a look at some of the options on the market and which one I'd recommend. We'll do an in depth dive on each shower with the pros and cons. If you don't want to read the whole thing and just check out my recommendation, here it is. Enjoy! I'm a backpacker at heart and even though some of the huge portable showers with privacy walls are cool, they're kind of impractical. The Nemo Helio is light enough you could actually take it with you on a backpacking trip without issue. It's pressurized flow lasts 7 minutes which is a luxurious amount of time for a camping shower. 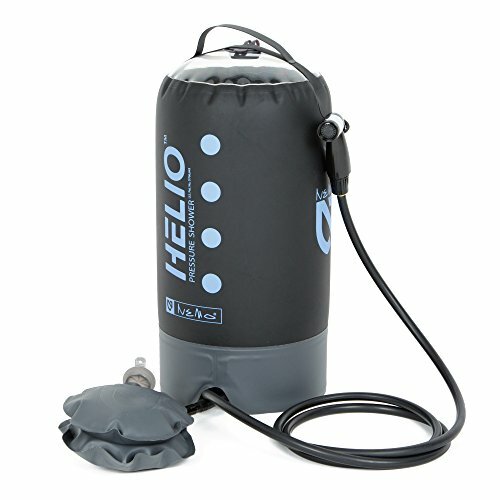 If you want a little more privacy then the best portable camping shower setup would be the Nemo Helio in addition to the WolfWise pop-up shower tent. 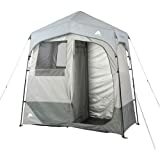 The shower tent gives you the privacy and the Helio provides the hot, pressurized water. Not bad for a wilderness shower! If you want to keep your gear as lightweight as possible, the Simple Shower is your best choice. It weighs 2 ounces and can turn any water bottle into a shower. It doesn't come with any fancy heating devices or any pressurized pumps. But this simplicity gives you two benefits. It's very lightweight and it's very inexpensive. The Simple Shower is the cheapest, lightest way to bring a shower with you on the trails. 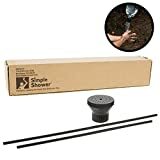 If you're looking for the absolute cheapest available camping shower, Coghlan's 5 gallon camp shower is your best bet. Coghlan's is known for their rock bottom prices and their camping shower comes in at a much lower price than the competition. The downside to this low price is the lack of durability and features. The valve on Coghlan's shower bag is hard to turn off and the bag that holds the shower water isn't very durable. It's not uncommon for these to spring leaks after just a couple of uses. If you're looking for something cheap you can take on 1 or 2 trips per year this bag could work but it's probably worth spending the extra $20 and getting our next option from Sea to Summit. The Sea to Summit Pocket Shower isn't the cheapest, lightest, fanciest, or easiest to use. But if you were rating it on a scale of 1-10, it would be like an 8.5 in every category. The Sea to Summit (S2S from now on) shower weighs 4 ounces and can hold 10 liters (2.5 gallons) of water. The shower bag itself is extremely durable and with the valve fully opened you can take an 8 minute shower. If you turn the water off while you're washing with soap, you can get 2 showers with just 1 refill of the bag. Even though the bag is black to absorb heat, it doesn't get very hot. The best way to get a hot shower with this bag is to fill it up 75% of the way with whatever water you have and fill the remaining 25% with boiling water. If you want to step your camping shower game up to the next level, the Zodi Outback Instant Hot Shower is what you're looking for. This portable water heater runs off of a propane tank to instantly heat your shower water. It can put out half a gallon per minute so if you bring a 5 gallon bucket you'll be able to take a 10 minute long hot shower. That's longer than most people shower for at home! The Zodi comes with a pretty weak nozzle so if you're going to drop the money on this thing you should probably invest in the Sea 2 Summit shower bag to hold the water. Obviously this setup isn't intended for backpacking due to the weight and the propane requirement. The lighter also requires 4 D-cell batteries so it's going to be a lot of weight to carry if you were backpacking. Most of the camp showers I've covered so far are just the part that dispense water. None of them offer any shelter or privacy and that's mostly because privacy means more weight and more money. But if you want to have a private room to shower when you're camping, the Ozark Trail Instant 2-Room Shower is the best of the best. In addition to providing a shower room and a separate space for changing/drying off, it comes with a 5 gallon solar heated shower. Since this thing is basically a tall version of a tent, you should set it up at home before you go camping. You'll want to make sure all the parts are working and fully functional (i.e. no broken poles or ropes) before you take it out into the wilderness. 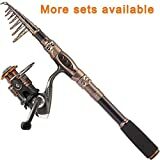 Since it weighs 20 pounds this is definitely a car camping item and not one you would want to consider for backpacking. There are a few things you need to figure out before you can decide on what kind of shower makes the most sense for you. If you read everything at the top of this article you'll have an idea of the variety of showers that are out there. Will you be using your camping shower for backpacking or car camping? 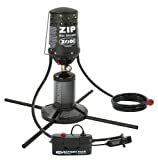 Camping showers range from lightweight plastic bags all the way up to propane fueled water heaters and 2 room tents. If you're planning to camp by your car or RV, then you can choose for a heavier system that has more luxuries. But if you're going backpacking or doing anything where you'd have to carry the shower on your back, you'll want to choose something more lightweight. You'll have to find the right balance between price and weight. The next thing to figure out is how much water you'll need to use in a shower. If you can shower 'military style' where you turn the water off when you're lathering your hair/body, then you won't use as much water and you can buy a smaller size camping shower. For 1 person, 5 gallons should be more than enough. If you've got 2+ people then go with 10 gallons or more. If you like to have the water run continuously or if you'll have multiple people using the shower one after another, then you'll want to look for something that's at least 10 gallons. One of my favorite backpacking sayings is "buy once, cry once". It means if you spend a lot of money on really nice gear, you'll cry once when you buy it but you'll be happy forever after. If you buy cheap, crappy gear, you'll cry every time you go to use it or when it inevitably breaks when you need it the most. While some camp showers, like Coghlan's, are really inexpensive, they don't hold up to years of use. If you're OK with that, then by all means get the cheapest shower you can find. Cheap shower = $10. Breaks after 1 year (2 uses). Cost per use = $5. Expensive shower = $100. Breaks after 15 years (30 uses) Cost per use = $3. 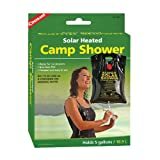 Solar powered camp showers are different from most solar powered items. Usually when you hear solar powered you think of solar panels that store up electricity and power a power bank, smart watch, or GPS device. But showers are different. They don't need electricity, they just need gravity. Battery powered camp showers work like small pumps. You can place the bottom end in a bucket of water and turn it on. The bottom side of the shower will pump water up to the head of the shower which you can use like a regular shower head. Honestly I'd stay away from these. In addition to being heavy from the batteries, they have a couple of key flaws. Carrying spare batteries is a pain. It's extra weight and should be avoided whenever possible. You're limited by the length of the tubing so your water source needs to be close to where you're showering. The water will probably be cold unless you buy a separate container just to heat it up. There are just too many issues with battery powered camp showers to make them feasible. Since showers can easily be set up to work via gravity, there's no reason to over-engineer a solution. Stick with the tried and true gravity set up and you'll save weight, money and frustration. Last, but not least, we have fuel powered showers. These are the top of the line, ultra luxurious camp showers. If you want to instantly heat water and have enough for everyone in your party to shower every day, this is what you're looking for. The only limitation to a fuel powered camp shower is how much propane fuel you can bring with you since that's what you'll be using to heat the water up. Depending on the specific set up you go with, you might need to provide your own shower device. Some of the fuel powered camp showers only heat the water while others have the included tubing and shower head so it's a totally self contained device. I saved the best for last. Gravity powered showers are my favorite. These are nothing more than glorified containers that you can place above your head and open a valve to take a shower. They have very few moving parts, don't rely on battery or fuel and can be carried almost anywhere. If you want to go backpacking and take your shower with you, this is the only realistic option. Many gravity powered showers are also 'solar powered' since they're black bags that absorb heat and warm your shower water up for you. All you do is hang them from a tree and you're ready to go. Now that I've covered everything you need to know to pick out your camp shower, you probably have some questions. Here are some of the most frequently asked questions about camp showers. If you have other questions just shoot me an email or drop a comment down below and I'll get it added. Does A Camping Shower Require Maintenance? Most camping showers are pretty straight forward. They usually work by using gravity and just have a single nozzle and shut off valve. There's nothing to lubricate, no filters to replace, they're pretty low maintenance. The only thing you'll want to watch out for is making sure you completely dry out the camping shower when you're back from your trip and you're done using it. The worst thing you can do is put your camping shower away when there's still water in there. Do Solar Heated Showers Really Work? Ummmm....kind of. Solar heated showers aren't much more than glorified black plastic bags. They absorb sunlight and if you leave them out in the sun long enough, they'll get warm. You're not going to get a hot shower though. Just warm. If you want a really hot shower then you'll need to get a fuel powered heating device. Another option is to boil water on your camp fire/stove and mix it in with your shower water. Once your water heats up, you should use it pretty quickly. If you move your camping shower into the shade or it starts to get cold, you'll lose that heat almost immediately. Why is that? Well, most camping showers aren't insulated at all. They can't be. If they were insulated, they wouldn't be able to heat the water up. If you insulate something, it keeps heat/cold in and blocks everything else out. Solar heated camp showers work by having zero insulation which means the heat they absorb from the sun is transferred to the water. But this also means the heat that goes into the water is also easily transferred back out. How many people can use a portable camping shower? If you leave the water on the entire time you're showering, you should expect to use about 2-3 gallons per person. If you shut the water off while you're lathering up (military style), you can get your water usage down to less than a gallon. To be safe, you should assume 3 gallons of water per person. Multiply that by the number of people in your group and you'll know how many people can use your camp shower before you have to refill it. 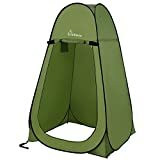 How long should my portable camping shower last? Most camping showers will last for at least 5 years. If you buy the cheapest shower available, you might be lucky to get 2 years of use. If you spring $100 for a top of the line shower it could still be going strong a decade from now. The other thing to think about is how complex your shower is. The very simple, gravity fed showers will last a lot longer than something that runs off of propane and has a lot of moving parts. Keep it simple and it will last longer.